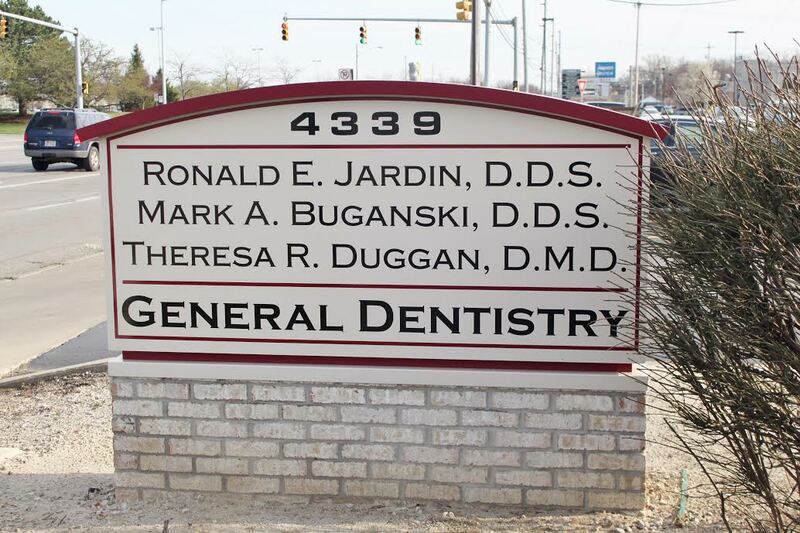 We would like to welcome you to our dental practice and explain our office policies and goals. We believe in the theories of modern dental care which do not support the old premise of "When it hurts-fix it." Through proper preventative care and regular checkups, we believe that is highly likely that most of our patients can expect to keep all of their teeth for many years to come. 1.A high degree of professional skill and ability. 2.A dedication to your oral healthcare. 3.A minimization of costly reconstructive work through proper preventative care. 4.The highest effort to make your visits as comfortable as possible. 5.The right treatment at the right time. 6.Fees that are fair and just for the services provided. 1.Cooperation in making and keeping appointments. 2.A conscientious effort toward good oral hygiene. 3.Recall visits to maintain optimum oral health. 4.Arrangement for the payment of fees at the time of service. The family practice of Drs. Jardin and Buganski has been located on Talmadge Rd. since November of 1993. Since then, there has been the addition of a new partner, Dr. Theresa R. Duggan, D.M.D. Despite having different titles, their is no difference between a D.D.S. (Doctor of Dental Surgery) and a D.M.D. (Doctor of Dental Medicine). Both degrees receive the same education and diploma. Before and after each patient appointment, all treatment surfaces (e.g. countertops, chair surfaces, lights, x-ray machines, and trays) are disinfected with the most effective and safest products available. To ensure your safety, we follow a number of standard sterilization procedures with all instruments and handpieces. First, they are brought into our sterilization room and placed in an ultrasonic cleaner to remove even microscopic debris. The instruments and handpieces are then rinsed and scrubbed thoroughly before being sterilized in an autoclave, which runs for 60 minutes and reaches temperatures of 400-425 degrees, thereby destroying all bacteria and all viruses. Our autoclave machine is monitored regularly to ensure its effectiveness and safety. Staff members use masks, safety glasses, and new gloves for each patient. All staff members are updated annually in proper patient protection procedures and have been vaccinated against the Hepatitis-B virus. We will be happy to answer any questions you may have regarding patient protection and give you a person tour of our sterilization facility. Poor dental health can affect your overall health. Gum disease (periodontal disease) has been linked to heart disease, premature deliveries, underweight babies, and other health conditions. We want to be a part of improving and understanding your overall health and dental health. Our entire staff is CPR certified and practices emergency protocols.